Considered by many to be the most influential US novelist the world has known, William Faulkner's roots and his writing are planted in a single obscure county in the Deep South. A foremost international modernist, Faulkner's subjects and characters, ironically, are more readily associated with the history and sociology of the most backward state in the Union. He experimented endlessly with narrative structure, developing an unorthodox writing style. Yet his main goal was to reveal the truth of "the human heart in conflict with itself," ultimately defining human nature through the lens of his own Southern experience. This comprehensive account of Faulkner's literary career features an exploration of his novels and key short stories, including The Sound and the Fury, As I Lay Dying, Absalom, Absalom!, and many more. 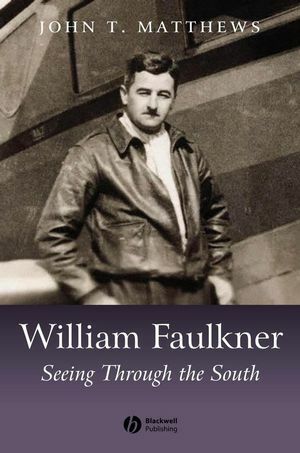 Drawing on psychoanalytic, post-structuralist, feminist, and post-colonial theory, it offers an imaginative topography of Faulkner's efforts to reckon with his Southern past, to acknowledge its modernization, and to develop his own modernist method. John T. Matthews is Professor of English at Boston University. Author of The Play of Faulkner’s Language (1982) and “The Sound and the Fury”: Faulkner and the Lost Cause (1991), Matthews has also written numerous articles on Faulkner. He was the 2006 recipient of Boston University Metcalf Award for Excellence in Teaching. "Matthews faces the crisis of Faulkner scholarship-with its cardboard Faulkners and its truncated canon-by giving us a more expansive, more relevant, and, frankly, more interesting Faulkner. His readings of the novels, particularly Sanctuary; If I Forget Thee; Jerusalem; Go Down, Moses; The Sound and the Fury; Absalom! Absalom! ; and the Snopes trilogy, are simply indispensable. Beautifully written and obviously the product of long years of scholarship, these readings affirm the "complex mixtures" that make Faulkner one of America's greatest novelist. "(Black Hills State University)"John T. Matthews's William Faulkner: Seeing through the South is the rare book that will prove vital and engaging both for readers new to Faulkner's writing and for scholars long devoted to it." (The Journal of American Studies, 2010)"